Adds a unique, summonable horse with extensive customization features and Convenient Horses compatibility. Also adds a new quest called "The Blacksted Legacy", the reward for which is the ability to summon Aeonbarr. This mod also contains some retextures versions of Chistian Paskota’s Sethai and Elthrai armors. Christian Paskota states on the mod page that the resources in the mod are free to use and edit, provided you credit him. Mod authors are also free to use the retextures of this armor I’ve made, provided you credit Christian Paskota for his work. Saerileth and Gamwich for the texture and mesh files for the Stone of Greywater, the Ring of Greywater and the Amulet of Greywater (Gemling Queen Resources). KrittaKitty for new horse textures (Realistic Primitive Horse Breeds – 2k). 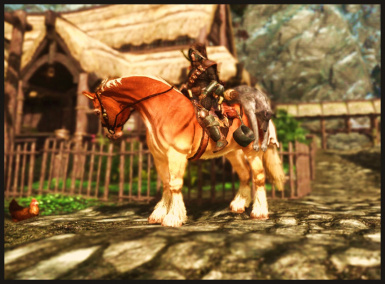 2) What makes this mod different from other summon horse mods? 1) Go to your Skyrim data folder and locate the .nif file for the armor you want Aeonbarr to equip. - This small update is a bug fix which stops the Blacksted Legacy quest being auto-completed whenever you edit something in the MCM. It also has tighter scripting around the quest to prevent some bugs that could occur there. This is a summonable horse mod with a twist: a large variety of customization options, and full compatibility with Convenient Horses. This mod adds a spell that will permanently summon the unique horse, Aeonbarr. Yes, there’s plenty of summonable horse mods out there (all with their own strengths and weaknesses), but this mod has several unique features that I hope will make it stand out, including full Convenient Horses compatibility. The mod requires SKSE and SkyUI. - Customize Aeonbarr’s follower behaviour. 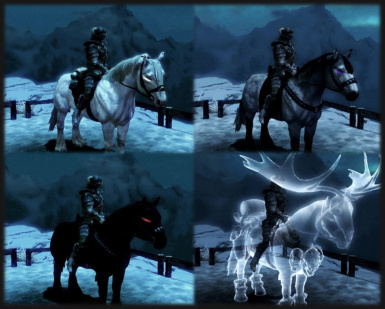 - Customize Aeonbarr’s armor using the armors provided in Convenient Horses. - Customize Aeonbarr’s speed, health and stamina. - Make full use of auto-looting. - Use mounted actions, like talking to NPCs, harvesting ingredients and rapidly dismounting. * This mod adds several new armors. You can use armor permutations included in this mod, and you can also use armors provided in the Convenient Horses mod (provided you have Convenient Horses, of course). 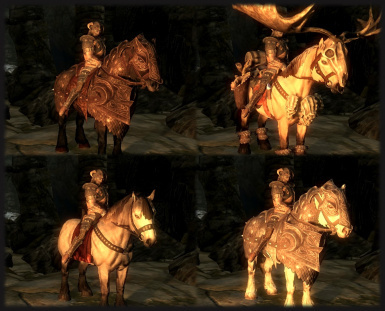 Many summoned horse mods require multiple spells to summon multiple horses and banish them. This mod includes just one spell, which you can use to both summon and banish Aeonbarr. Furthermore, you can receive this as either a conjuration spell with a magicka cost (good for mages), or a lesser power with no magicka cost (good for warriors). 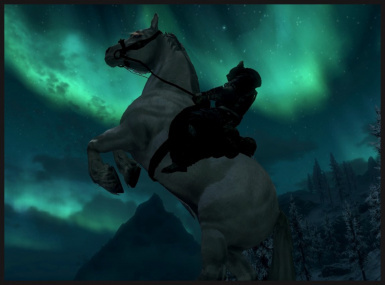 This won’t be a big problem for some people, but for me, I find that summoning unique named horses deserves a more unique process than buying a tome from a vendor (Summoning Arvak, for example, requires a special quest in the Soul Cairn). This mod fixes this problem. The ability to summon Aeonbarr is now a reward for a small quest called "The Blacksted Legacy", which is included in this mod. During the quest, you can also discover some of Aeonbarr’s backstory. of a conjuration spell. How you summon Aeonbarr (either a spell or a power) can be customized in the mod's MCM. 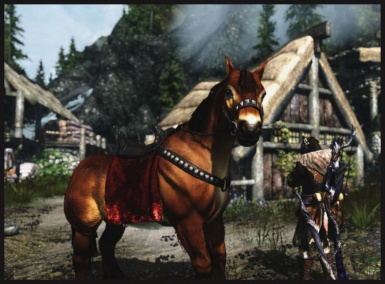 Being an individual horse with a small backstory, Aeonbarr has a bit more of a personality to him than a generic summon in much the same way that followers like Lydia and Serana have more personality than a summoned dremora. - “Alfred and the Unknown Huntsman”, a children’s story featuring Aeonbarr. This is also a skill book that will improve your block skill. This book can be found in Blacksted Barrow. It has also been added to the list of randomly generated books, so you may encounter it elsewhere. - “The Blacksted Legacy”, a scholarly book that speculates on the origins of Aeonbarr. Reading this book will initiate the quest, "The Blacksted Legacy", the reward for which is the ability to summon Aeonbarr. Two versions of this book exist: one in Blacksted Barrow, and one in Dead Man's drink. - “Alben’s Notes”, a four-part account of the events surrounding the new quest, the Blacksted Legacy. Part 4 is found on Alben's corpse outside Blacksted Barrow; Parts 1-3 are in the Barrow itself. Another problem with summoning horses in most mods is that it counts towards your summon count. In other words, you have to choose between summoning a fire atronach (for example) and a horse. This isn’t always a problem, but for some it could be irritating. This is not the case in this mod. Aeonbarr does not count towards your summon count. Furthermore, you won’t have to worry about breaking immersion by summoning two Aeonbarr’s if you have the Twin Souls perk. Aeonbarr is an individual, and you can only summon one of him at a time. The ability to summon Aeonbarr is granted to the player as a reward for the newly added quest, “The Blacksted Legacy”. To begin this quest, head to Blacksted Barrow in western Falkreath (see the images above). Alternatively, you can open the MCM menu and toggle the Complete Quest option. This will automatically complete the Blacksted Legacy quest, even if you haven't started it yet, immediately granting you the power to summon Aeonbarr. The drawback here is that you miss out on the more immersive aspects of this mod, but for some users this won’t be seen as a problem. -It is highly recommended that you make Aeonbarr an essential character. If you don’t, CH will remove Aeonbarr’s essential status, which could cause problems if he dies. I’ve added some fail safe scripts to prevent any problems from arising, but it’s better to be on the safe side. -To register Aeonbarr as “your horse”, thus allowing you to take full advantage of all the features in CH, you will need to sit on him. 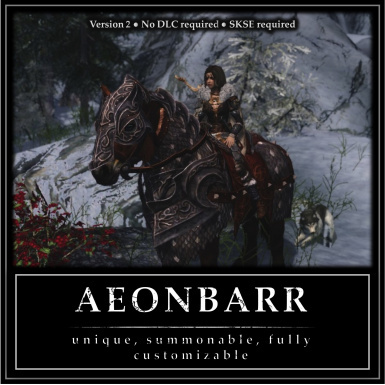 -There are two ways to customize Aeonbarr’s speed: with the Aeonbarr MCM (A MCM) and with the Convenient Horses MCM (CH MCM). You should use the CH MCM and set the A MCM speed value to 0. -If you want to use the armors provided in the CH mod on Aeonbarr, you must open up the A MCM and set Aeonbarr’s Equipment Type to Convenient Armor. If you experience a bug that is not listed in this section, please see "Common Bug Causes" below. As far as I can tell (from my own personal research, which may be flawed), this is a bug that can be caused by launching Skyrim with SKSE. Essentially, the bug causes horses to fly around and slide along the ground erratically. It may also cause a CTD. I've provided links to some videos that showcase this bug below. As far as I can tell, this bug is not caused by this mod (so I might not be able to fix it), but this mod is particularly susceptible to the bug because it requires SKSE and it contains a horse. From what I can tell, dismounting should fix the bug if it begins to occur. If you find yourself affected, I recommend saving whenever you mount Aeonbarr, just to be safe. Sometimes, you might customize Aeonbarr's eyes (for example) and find that his eyes disappear completely. The bug can sometimes occur when you customize a features that requires a reset, such as his size or speed. To fix the issue, just re-select the feature you want to customize in the MCM. I don't have a great deal of expertise on how mods are implemented, but having been modding for over a year now, I've found the three most common causes of bugs are: 1) An improper installation, which can usually be fixed by deleting the mod from your system and re-installing it; 2) Scripting issues, which occur when you have a lot of mods that are script-heavy (this can be fixed by disabling other mods); 3) Incompatibility caused by clashes with another mod (this can sometimes be fixed by moving the buggy mod lower down in the load order). If ever you experience a bug in this mod, it is likely that the cause of the bug is one of those listed above. On the off chance it isn't, I recommend you post a comment in the posts section describing your bug. I might be able to help (though I may just end up referring you back to this section for an explanation). How do I solve the puzzle in Blacksted Barrow? The puzzle is in a room with three locked gates. Each gate has a combination of three animals; for example the main gate has the combination of Eagle, Owl, Wolf. The combination is displayed above the door. At the centre of the room are three pillars. To unlock the main gate, one pillar needs to be rotated to the Eagle, one to the Owl, and one to the Wolf. Each pillar has an arrow at its base that shows the forward-facing part of the pillar, i.e. the bit that should be rotated to Eagle/Owl/Wolf. Once the pillars have been rotated, pull the lever in the center of the room. This will open the main gate. How do I get Aeonbarr? The ability to summon Aeonbarr is the reward for a new quest called “The Blacksted Legacy”. 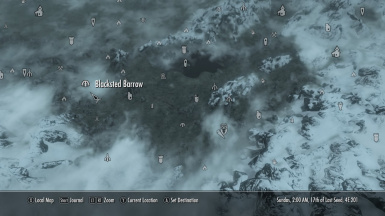 To begin this quest, head to Blacksted Barrow (see the images above). Alternatively, choose the Complete Quest option in the MCM. It's in western Falkreath. Reading the book, "the Blacksted Legacy" will mark it on your map. Where can I find the “Blacksted Legacy” book? Two copies exist. One is in Blacksted Barrow. The other can be found sitting on a table in Dead Man’s Drink, i.e. the Falkreath inn. What existing files does this mod edit? So, how is the mod implemented? Put simply, most summon spells work by creating a new creature every time you cast the spell. This doesn’t work alongside CH, hence why so many of the features don’t work on summoned horses. This mod works differently. Aeonbarr is not a generic creature that is spawned anew with every summon; Aeonbarr is a unique NPC. 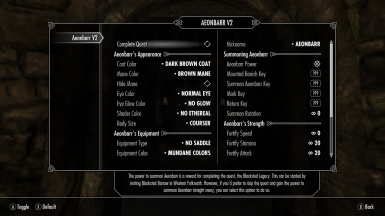 The spell that summons Aeonbarr essentially moves Aeonbarr around between Skyrim and a second, inaccessible cell. This process has quite a bit of scripting to make the effects seem natural, fluid, and as indistinguishable from a normal summoning spell as possible. The Convenient Horses features don’t seem to be working on Aeonbarr…why not? For any features to work on Aeonbarr, he must be registered as “your horse”. This isn’t done automatically when he is summoned; you must sit on him first to make him “your horse”. Once this is done, most features should be compatible. For some features (like speed), the effects can only be applied when Aeonbarr is not mounted. If changing a feature like speed, you’ll have to un-mount and then re-mount Aeonbarr. Is it an armor problem? If you’re having trouble equipping the armor provided in Convenient Horses on Aeonbarr, remember: you have to set Aeonbarr’s Equipment Type to No Saddle in the MCM first. Post your problem in the Posts section. I try to check the Nexus every day to answer questions, and if you have a problem I or someone else might be able to help. So, Aeonbarr…where’d that name come from? Aeonbarr is an alternate spelling of Enbarr, the horse of the god, Lugh, who features in Irish mythology as a hero and High King. Whilst I’ve written quite a lot of material to create a small backstory for Aeonbarr, I’ve deliberately left his origins a mystery. Whether or not he is a daedra, I cannot say…I leave that to your personal interpretation. What happens if Aeonbarr dies? Aeonbarr is essential and so won’t usually die, but if his health drops too low in battle, he will be un-summoned immediately. He can be re-summoned at any time with full health. For those using CH, it is recommended that you make Aeonbarr essential, otherwise he could be killed and this might cause all kinds of problems. I’ve implemented systems that should prevent Aeonbarr’s death even when he isn’t essential, but it’s better to be safe. Seirun for creating the Immersive Horses patch. and the Amulet of Greywater (Gemling Queen Resources). KrittaKitty for all the new horse textures I've used in this mod (Realistic Primitive Horse Breeds – 2k). Svammelie, admay19, Minu2109, b7ll, DARKEULOGY, IWKMS, dave4a and Kayanakoe for sharing their pictures. Brodual, Nozi87 and MMOxReview for their mod reviews.